I rarely venture in to rocking high-top sneaks, but once in a blue moon, a pair will come along that will make me think of stepping outside of my comfort zone - no pun intended. 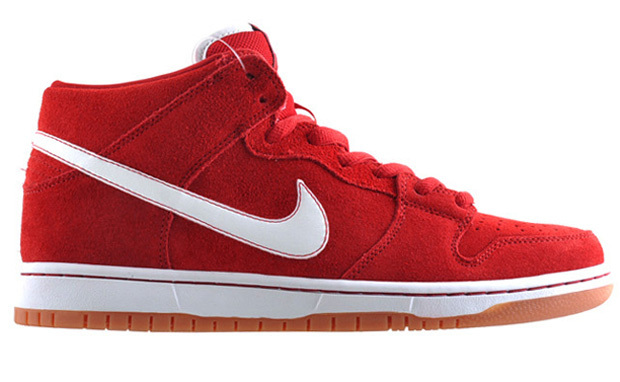 This Nike Dunk Hi is the first to fall in that category here in 2011. Basic shoe? Yes. But much as Tyler the Creater/Odd Future/OFWGKTA is the antithesis of the Drake's, Kanye's, and BOB's - these shoes are a nice break from the crazy colorways that the companies are doing to commemorate All-Star weekend (yeah - I realize the craziness factor goes in the opposite direction - but just ride with it, haha). Suede, Brick upper with white trimming, offset with brick stitching, topped off with a classic gum sole.